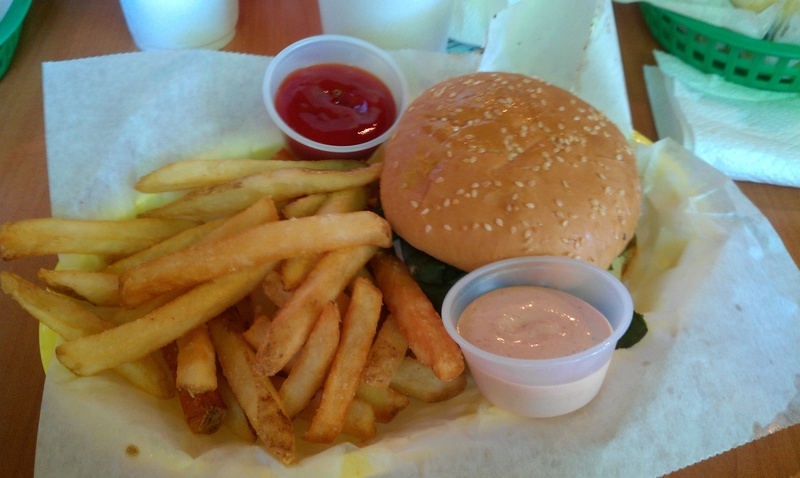 A bison burger, fries and a side of Bunz sauce at Bunz Burgerz. The only thing more aggravating than replacing a perfectly good “s” with a “z” in a restaurant name is waiting for an hour for your food at aforementioned burger restaurant. Unfortunately, these are the things that I remember the most about my first visit to Bunz Burgerz on Baxter Avenue. My burger, though it was indeed delicious, wasn’t tasty enough make me forget all of the kinks that dampened my inaugural trip to a place voted “Best of Louisville” burger. Groupon introduced me to Bunz Burgerz with a deal that allowed participants to buy $10 worth of food at the restaurant for just five bucks. I can’t miss a deal like that in my current economic state, so I purchased the Groupon and planned a Saturday lunch trip with two of my friends. I was prepared to indulge in a good ol’ American burger made of local ingredients. Autumn, one of my dining companions, bought the maximum three Groupons to Bunz Burgerz because she liked it so much. And some online menu studying revealed that this restaurant provided many options to jazz up any hamburger. Bunz Burgerz offers a list of Gourmet Bunz starting at $4.99. This portion of the menu features the restaurant’s original creations, such as the Blue State Bunz with two patties, blue cheese, pickles and Bunz sauce ($6.79) and the Highland Bunz with a single patty, feta cheese, fried capers, chopped olive blend and mayo. The control freaks can build their own burgers with a variety of veggies, sauces and cheeses. And Bunz Burgerz tries to please lots of diets with a Portabella Bunz ($4.89), Salmon Bunz ($5.79) or Turkey Bunz ($5.89). I decided what I wanted before I arrived at Bunz Burgerz. A Saturday lunch rush in a tiny eatery is not the ideal time or place for contemplating a menu’s options. Bunz Burgerz is a four-tables-and-two-counters-sized joint. When I arrived at about 1 p.m., the dining area was filled with a line of people waiting to order, folks chomping away at delicious-looking burgers and onion rings at the few coveted tables, and individuals tucked in tiny places with their arms crossed waiting for their order. After I ordered a Bison Bunz ($5.99) with pepperjack cheese (49 cents), lettuce and tomato, fries and a drink ($2.89), my two friends and I squeezed to a window-side counter with no chairs to wait for our order. Between teaching one another about our new Android phones, we table stalked, aka stared at patrons eating at other tables grasping for signs that they will leave soon. Eventually, we migrated to a table with only two chairs as the previous eaters were throwing away their trash. Then, after seeing that one member of our trio was left without a seat, a woman who just finished our meal offered us her soon-to-be-empty three-top. An hour passed, and my friends and I were still burger-less. A trickle of hungry patrons went to the counter to ask about the progress of their order. Bunz Burgerz only had two people working at the restaurant – the cook and the cashier. They were generous with their apologies, but this duo wasn’t enough to effectively serve a busy Saturday lunch crowd in one of the most happening corridors in town. About 70 minutes into my visit to Bunz Burgerz, bison burger was in hand, then in mouth. The upside to waiting at the restaurant is that each burger is made to order. My bison burger, a leaner take on a traditional beef patty, was piping hot, as were the heap of fries beneath it. My patty was slightly pink in the center, which kept the burger from drying out. The bison appeared to be pre-patted, as opposed to the freshly formed patties of my friends’ beef burgers. 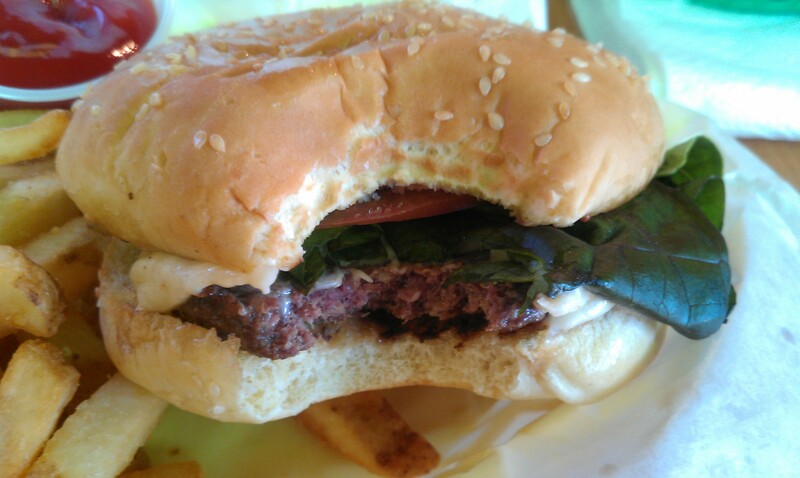 But it was still a dang good burger without a lot of bells and whistles. And pepperjack is always a good road to take to Burgertown if the option is available. All this was perched on a soft sesame seed bun that was buttered and toasted. The Bunz sauce, which I got in a container on the side, really spiced up my burger. It’s a mayo-based condiment with chipotle seasoning, which gave it a pink hue and a spicy kick. It was also good for fry dipping. My buddies, who ordered the Red State Bunz (two patties, spicy pickles, pepperjack cheese, grilled jalapenos, grilled onions, hot sauce and mayo, $6.69) and a Single Bunz ($3.89), were just as pleased with their meals, if not more. The beef patties were juicy and thick. But waiting an hour for some meat between two pieces of bread is asking a lot from me. Will I return to Bunz Burgerz? Probably so. My burger was good. My fries were crispy. My dipping sauce was delicious. A restaurant is allowed to have off days. I believe in such things as an overwhelmed staff and doling out second chances. But I also believe that going to Bunz Burgerz on a weekday is the way to go. When you enter the restaurant, a partial menu is located straight ahead on the lower part of the counter. Laminated copies of the full menu are on the counter. If you don’t know what you want, please step to the side or step outside – space is tight. The restaurant offers Bunz of the Day, which can get pretty interesting. The special on my visit was a burger with chili and sour cream, among other toppings. Bunz Burgerz, 969 1/2 Baxter Ave., Louisville, Ky. I had a similar long, yet tasty, experience. I went on a weekday. There was only ONE person working there and if we hadn’t already paid for our food, we would have left. I was glad my burger was good, but I’m not sure it was 60 minutes of good. If they can get the wait and order efficiency under control, it’ll be a gem. I got a mention by name!!! I’m FAMOUS!!!! Yeah, the wait was a lot longer than it was the 1st time I went there. But to be honest, hamming it up w/ you & WJ, i didn’t even notice the wait! !